Who is going to be the one to lead us out of the climate crisis? Who leads us out of the climate crisis? Despite decades of discussions to reduce our CO2 emissions, they went up again last year as usual – by almost three percent. Since the Kyoto Protocol was signed, more than twenty years ago, fossil emissions have increased by more than half. The failure of our world leaders, and the greed of industry, is reflected in melting polar caps, persistent droughts, and growing hurricanes. Time for a nice get-together, they must have thought. Last week, the political and economic elite of the world gathered in the Swiss village of Davos for the annual meeting of the World Economic Forum. If you look at this organization superficially (and ignore the many private jets) you could quickly conclude they have the best intentions on the topic of climate. Ten years ago, for example, they stood at the basis of an appeal to the G8, by 99 of the largest companies in the world, that emissions should be halved by 2050. The recent letter in The Wall Street Journal, in which a whole group of top economists emphasize that a tax on CO2 is necessary to save our climate, was also initiated by the WEF. The message from Davos is clear: governments need to come up with a clear climate policy so our global economy can become greener. That sounds reasonable – until you realize this means that the business community does not have to take any responsibility. Polluting companies can say that they take the climate problem seriously, while referring to such statements. Meanwhile, they will continue to emit CO2 as long as they are not stopped by the government. It's about time for politicians to lead the way out of the climate dilemma. But here too, Davos is better at imaging than in solutions. Mark Rutte, the Prime Minister of the Netherlands, was allowed to join the debate on climate leadership. I have no idea why he sat there. In 2015, he was forced by a court ruling to reduce emissions by 25% in 2020. Instead of rolling up his sleeves and getting things done, he appealed the verdict. He lost that appeal, and in the remaining year he will not even come close to reaching the 25% target. No wonder he preferred to talk about how the Netherlands helps Bangladesh with its water management instead of the closure of coal-fired plants. In fact, he explicitly excluded to do more than neighboring countries. That's what they call a climate leader in Davos. Sounds familiar. Erna Solberg, the Prime Minister of Norway, was in Finland a week ago because the Nordic countries want to take the lead in the fight against climate change. The joint statement included many nice-sounding phrases about climate-neutral Scandinavia, as well as a few useful initiatives. But the objectives are not very concrete, and no mention is made of the Norwegian oil and gas industry. A climate-neutral Scandinavia that sustains CO2 emissions in the rest of the world. Can it be more hypocritical? Swedish climate activist Greta Thunberg arrived at Davos last week after a 32-hour train ride to the Swiss mountains, where she reminded the rich of the earth that they have destroyed the planet. The Norwegian prime minister can get away with this because she faces little opposition from parliament. The Norwegian minister of environment, Ola Elvestuen, spoke last week in Tromsø at the annual conference Arctic Frontiers about the rapidly warming Arctic, and the need to immediately reduce our emissions. In spite of these appealing words, he manages to be part of a government that has opened up the polar region in the search for more oil. The political party Venstre: a kind of mini-Davos. Unfortunately, the opposition is not necessarily better, exemplified by the leader of the Norwegian labor party, Jonas Gahr Støre, who immediately tried to suppress the discussion about oil subsidies, despite the fact that many in his party want to – not in the least their youth party. Apparently, that's also leadership. In short, politicians and businessmen like to use a lot of nice words about the climate, pat each other on the back, and move on to the polluting business of the day. 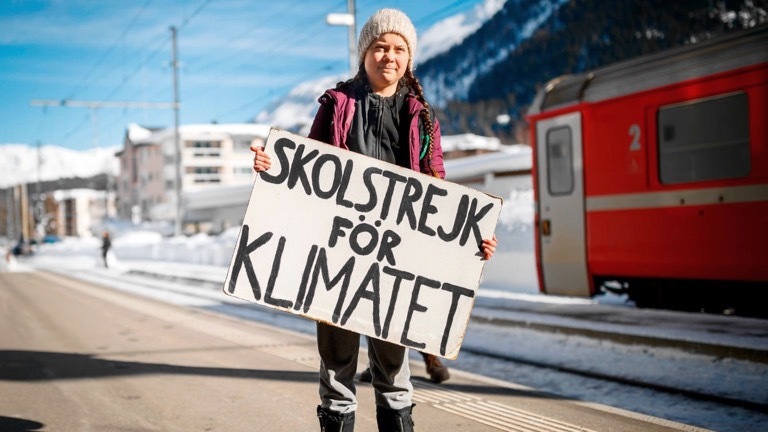 Meanwhile, activist Greta Thunberg took the train for 32 hours to the Swiss mountain village to be able to tell the exorbitant rich of the planet to their faces that they have destroyed the planet while amassing their wealth. On her own, this 16-year-old has shown more sincerity and leadership than three decades of meetings in Davos have. The climate strike that Thunberg started last summer in front of the Swedish parliament has been followed up across the world, as far as Australia, where thousands of students were on strike last November. In Belgium, they went even further: 32,000 students were walking through the streets of Brussels last Thursday to demand a better climate policy. This leadership was followed up last Sunday with the largest Belgian climate demonstration ever, with 70,000 people. While politicians and business continue to talk, but do nothing, a generation stands up that refuses to clean up our mess. Suddenly, I'm a lot more hopeful about the future.